Compare prepaid debit cards to rebuild credit carefully. This is a specialized product and not all prepaid debit cards are designed to assist cardholders in rebuilding their credit. Consumers with very low credit scores oftentimes have no choice but to turn to prepaid debit and credit cards because they are not able to get approved for any other type of card. Even secured credit cards can be difficult to obtain with bad credit, and some financial institutions will not allow people with bad credit to open checking accounts or obtain debit cards. Consumers in this situation who want to carry debit cards in their wallets must turn to prepaid cards. Prepaid debit cards are funded by the buyer and can be used for purchases from merchants accepting debit cards. Many prepaid debit cards are reloadable and some of them are accompanied by lines of credit, although this feature may be difficult to get approved for if the cardholder's credit is significantly damaged. Compare the fees. Prepaid debit cards -particularly reloadable prepaid debit cards - commonly have fees for the purchase of the card as well as monthly or annual maintenance fees. Look for a prepaid card that features the lowest fees while still offering sufficient customer service. Compare the terms. Some prepaid debit cards feature restrictions that may limit the amount of money loadable on the card or the number of times the card can be used within a month's time. 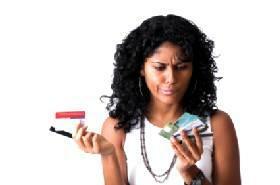 Find a prepaid debit card that does not feature restrictions which make the card difficult to use. Compare customer satisfaction. Review consumer websites or talk to other people who have prepaid debit cards and find out if they are happy with their cards. Sometimes there are recurring complaints about one particular card, yet most people do not hear about the complaints before obtaining the card because they did not do comparison research beforehand. Find the best prepaid debit card by looking for the card with the lowest price and the best features. When the goal is to rebuild credit, getting a good payment history reported to credit bureaus can certainly boost a score noticeably. A specialized prepaid debit card product is available through a few different sources that can help build credit scores and rebuild credit history. The consumer obtains a prepaid debit card and funds the account. With some cards, the consumer can apply for a credit line attached to the card immediately, while in some instances the cardholder must wait until a specific period of time has passed before he or she is eligible for the credit line. The prepaid card issuer regularly reports payment history information to the credit reporting bureaus, which helps the cardholder to build a credit history as long as the payment history is positive. In many instances, the credit line is dependent upon the cardholder signing up for paychecks to be directly deposited to the card account. This line of credit essentially acts as a payday loan in the sense that the amount of credit available is directly related to the anticipated amount of the recurring deposit. Is a prepaid card designed to rebuild credit the best choice for you? Compare the various cards available to decide if this type of card is right for you and to find out which card is best. Start with any financial institutions with which you already have a relationship, including banks and credit unions. Find out what options these institutions offer, but also use some of the tools available online to do the comparisons. Websites like CreditCards.com and BankRate.com both offer easy comparison tools which will provide the pros and cons of the available prepaid cards featuring credit reporting. As this type of card gains popularity, expect an increase in the number of prepaid debit cards featuring a credit building feature. With a wider variety of cards to choose from, the need to compare prepaid debit cards to rebuild credit is more important than ever.